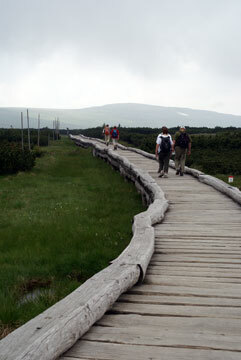 In the northern part of the Czech Republic, on the border with Poland, lies the Krkonoše Mountain Range, sometime known as the Giants Mountains. 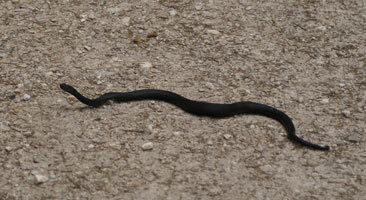 We went there for a walk, and almost immediately after stepping out of our car, this snake crossed our path. 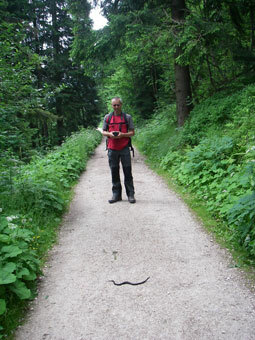 Fortunately he wasn't very big, so we weren't stopped by him. Talking about nature! 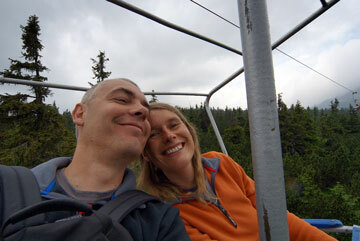 We cheated by taking a cable car to the top of the Sněška, the highest mountain. 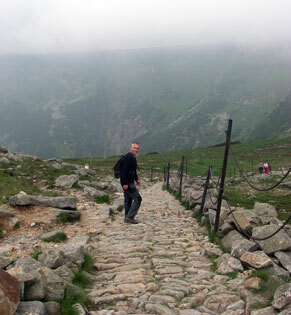 As it is 1602 meters high, it is inevitable it is nót called 'Giants' because it is very high. A look at a map will show you it isn't very large either. No, the name is because there live giants over here. 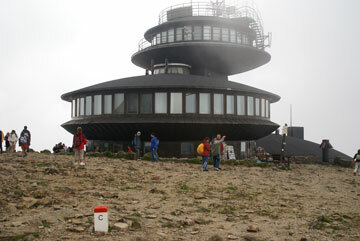 There was one standing near the panorama restaurant, but as he was about our own size, we think he was a fake. 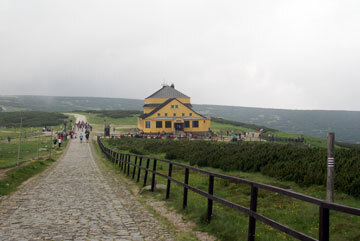 From the panorama restaurant, our walk followed the Czech-Polish border for a while. 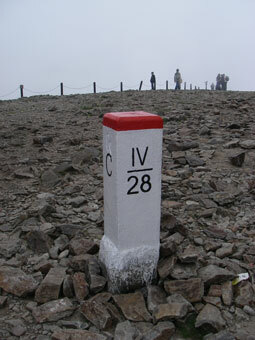 We saw many of those little red/white marker posts. And no, we didn't count them. 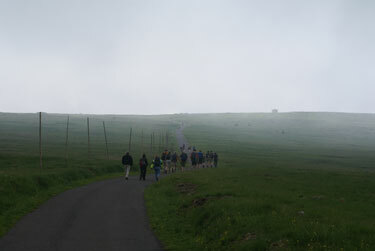 The first part of the way is pretty steep. 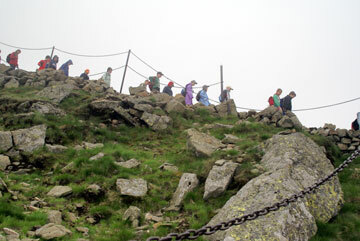 And we were not alone: there were several school classes for their annual trip. Walking between a class of school children is not our idea of a nice walk, so we went downhill very fast, just to be in front of them. 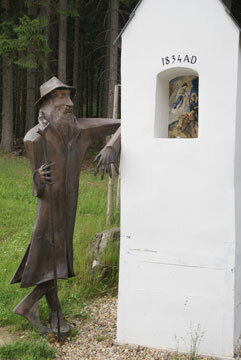 Every 3 or 4 kilometres you find a bouda. That has nothing to do with religion, but is a tavern. 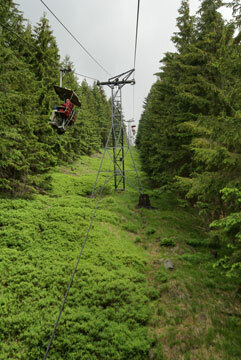 We were happy to find out that most people walked only from the cable car to the first bouda, the yellow one on the picture below. Probably because of its setting it reminded us of the Post House on Vlieland, but a closer look revealed some differences, like the shape and colour of the buildings. And actually the Post House is not in the mountains, but in the dunes. Our trip brought us to the swamp where the Elbe starts. 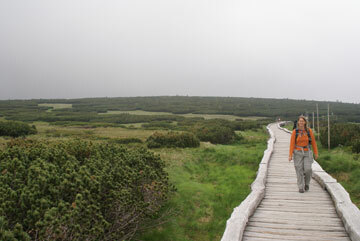 To protect the peat and at the same time prevent the tourists from wet feet, wooden walkways are built. At the end of our walk we saw another "Giant". This one was even smaller than we are. Yes, we know Dutch people are the tallest people in the world, but we still expect a giant to be a bit bigger than this little dipshit.